An elections bill filed late Wednesday night and approved by a House committee Thursday morning is causing chaos and concern among state elections officials and watchdog groups. The new version of Senate Bill 325, which until today was a bill dealing with tax policy, would change early voting, a political and legal flashpoint in the state, in a number of fundamental ways. Presenting the bill during the House committee meeting, Rep. David Lewis (R-Harnett) said it would provide greater access and uniformity during early voting. Critics of the proposal disagree. They say mandatory 12 hour shifts at voting sites on weekdays will likely be difficult for some counties to sustain with volunteers already hard to come by. This will likely result in fewer sites, they said. Greg Flynn, chairman of the Wake County Board of Elections, was on hand to make that point at Thursday’s House committee hearing. He told lawmakers the board is already beginning to plan sites and times. A change of this sort could make that harder, he said. 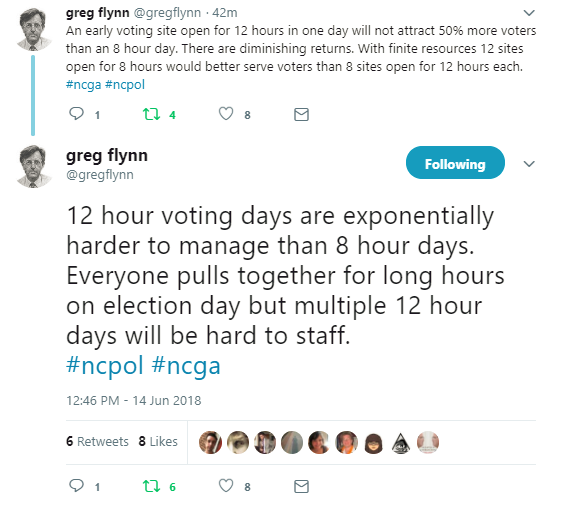 Flynn took to Twitter throughout the day to comment on the bill and what it would mean for those who organize and volunteer during elections. Bob Phillips, executive director of Common Cause NC, criticized both the process and the effect. “A bill introduced near midnight and rushed through a committee process the next morning could have a major impact on voters’ rights,” Phillips said in a statement. Democracy North Carolina’s Executive Director Tomas Lopez agreed. “Once again, politicians in Raleigh are coming back for a second bite at voting restrictions first introduced and overturned by a federal court in 2013, without input from election officials and the public,” Lopez said in a statement Thursday. The lack of input from state election officials was also a problem for the State Board of Elections and Ethics Enforcement. An emergency meeting of the board was called at the same time the bill was being debated in a House committee Thursday morning. Board Chairman Andy Penry said it shouldn’t have happened that way. The board voted Thursday afternoon to send a letter to the General Assembly requesting 24 hours’ notice when it is going to introduce legislation that will impact elections that the board will have to administer. The Bipartisan State Board of Elections and Ethics Enforcement wishes to assist the General Assembly in its review of proposals affecting the administration of elections, lobbying, and ethics laws. To do so productively, members of the State Board request that each Chamber provide notice of legislation at least 24 hours prior to the public introduction of any measure affecting areas administered by the agency. The State Board is mindful of the meaningful distinction between your role and ours under the Constitution and appreciates your consideration of this request. Board Vice Chairman Joshua Malcolm stressed that while the board didn’t wish to wade into a political fight, it has a role to play in elections and should at least be consulted when sweeping changes are in the works. “It is an executive agency’s responsibility to routinely provide the legislative branch of any government feedback on any legislation,” Malcolm said. Board member Stella Anderson said she did not consider the board’s letter to be political. What is political, Anderson said, is lawmakers proposing major changes of this sort without consulting experts and the very people tasked with running elections in the state. Two board members, John Lewis and Stacy Eggers, voted against the board’s letter to lawmakers and warned it could have negative consequences. The state Board of Elections has frequently been drawn into political controversies in the last few years, from fights over its membership and composition to its being drawn into a protracted and controversial recount over the gubernatorial race in 2016. The early voting bill is on its way to a full debate in the General Assembly as lawmakers rush to wind down the current legislative session by the end of June.